Happy Labor Day Weekend, fellow Friday Fixers! I’m sure you’re looking forward to the long weekend as much as I am, but before you mentally check out, join me on Friday Fix lane for the what’s-what in content marketing this week. Trending this week (as you’re soon to see) is the importance of video. Last week we launched into the highly relevant topic of visual storytelling, and this week, we and other content marketing pundits are going into detail with a focus on videos. We also explore inbound marketing and content marketing as drivers for ROI as well as why every tech company needs a chief evangelist (we also explain what that is). So, start relaxing early by kicking your feet up and reading the Fix. Oh, and have a Happy Labor Day Weekend! Video is one of the (if not the) most effective storytelling mediums (sorry, pen and paper…not to worry, I still love you). Adam Toren makes three robust points about what video marketing does for your brand. He explains how video is able to tap into areas of our brain that target emotions and thus bonding, trust, and discussion. Think about it…when you see something that excites you, you talk about it, right? This article by Owen Hemsath is a great read because it’s power-packed with tips and information that you can use to fully understand the function and relevance of video in content marketing and how you can best use it to tell your stories and boost your brand (and then some). For example, he talks about the three essential components of every successful YouTube campaign (attract, retain, monetize), why you should get rid of videos that are performing up to scratch, and that you should write the script for your videos as a team. Check out the article for all 16 tips and the logic behind them. So, we’re three for three on content marketing pundits who assert that video is the bee’s knees for content marketers, and they all have equally unique and relevant points to make about the indisputable power of video. In this post, Hurricane Media operator Jon Mowat sounds off on the power of moving pictures. If you’ve been wondering why you should use video marketing or aren’t convinced by other testimony, Jon brings the statistics. Per a Cisco study, by 2019, video will account for 80% of consumer Internet traffic (that’s up from 64% in 2014). The article goes on to discuss how video levels the playing field and plays into storytelling. So, check it out; get the facts. Should Content Marketing Entertain? Lessons from a Content Strategist? My knee-jerk response to Paige Conolly’s rhetorical title question is yes, content should entertain, but don’t take my immediate response for it; see what Paige has to say. While the answer to the content question is a little more cut and dry than yes because there are other things that content storytellers have to focus on, ultimately, there should be some entertainment value in your content marketing…even when your goal has nothing to do with entertainment? Why? Because entertaining means attention grabbing and emotionally compelling. See what Paige has to say to get her full insight on why content marketing needs entertainment value. Houston, Steve Armeni has identified a problem, and this one isn’t a quick-fix answer because he feels folks have lost sight of a few things and are thus having trouble discerning whether their funds that drive ROI are better invested in inbound marketing or content marketing. To begin, Steve defines the difference between the two types of marketing, so if you don’t know the definition of each, that information alone makes this piece worth the read. Rather than giving a firm answer to his question, Steve explores how you can invest in each to drive ROI. So, are you going to invest in storytelling or in compelling action? There are valid reasons to support action in each instance. Theo Priestly is correct when he says that the word evangelist conjures images of some TV personality passionately expounding on a topic (usually a religious one is what pops into my head); however, the term has broad applications. For example, my husband gets evangelistic about how delicious he finds grilled corn to be every summer. In content marketing, your Chief Evangelist does the same thing. Your evangelist creates an authentic and inspiring story that excites and incentivizes folks both in and out of the organization. The end results? Pretty darn spectacular. Read Theo’s article for the full story. Will Artificial Intelligence Kill Content Marketing? Okay, David Tile…you have my attention mostly because I’m a bit concerned about this thing we call job security. Many feel that there’s a very real possibility that AI could give we humans a run for our money (we created you, AI! We created you! How could you betray us like this? ); however, such an event won’t take place for many years (per a quote from Jayson DeMers), and who knows what will happen between then and now? If you’re curious about the logistics or the reality of this discussion regarding the distant future of content marketing, definitely check out this piece. 2015 is almost over (take a minute to let that sink in), but there’s still time to get into the fast lane. Ann Smarty brings eight smart surefire tips for stepping it up. These are all tips we’ve seen before (but now they’re compressed into one handy-dandy article). For example, be accessible on all devices, never doubt the power of infographics, and increase the quality of your content. Ann also highlights useful resources like Quora and the Hemingway App, which have been touted previously (so, if you haven’t checked them out, what are you waiting for?). I haven’t shared one of these “normal by the numbers posts” in a long time, but I really like Louis Foong’s (perhaps because he uses an infographic to share the details). Anyway, this post is a great way to do what Ann suggests in the previous post and check out the competition. See what others are doing, in what measure, and figure out where you stand among them. Are you normal by the numbers? Naturally, being the leader of industry that you are, staying abreast of content marketing talks and trends is high on your priority list, but how do you do it in the most time-efficient manner possible? Easy! Click on Jonathan Lang’s article for a list of 25 “who’s who” among content marketing folk in the Twitter-verse and start following those who seem to be the best fits for you (or just follow all of them). So, in addition to reading the Friday Fix every week and the Storyteller Agency on Twitter (insert shameless plug here), following content pundits on Twitter will keep you abreast of the most up-to-date information and content trends. Are you like me in that when you watch shows like Top Chef you feel like you know the people on the video? Like, I feel Padma Lakshmi and I are besties even though she has no idea who I am and would probably be creeped out if we actually met (Oh, Pads! How’s Tom?). Well, as a business, you want your audience to get to know you, right? What better way to do that than via video? There are other perks to rolling the film and posting it to your site. For example, if writing isn’t your forte, video is a platform for you to communicate and to be endearing (which, consequently, grammar mistakes that can happen in even the best of writing aren’t). Okay, so it’s almost the end of August, and I’m already getting powerful hankerings for crisp autumn breezes and apple cinnamon and pumpkin spice scents to compliment the upcoming season. At least we’re one glorious Friday Fix closer to all of that fall freshness, right? Speaking of Friday Fixes, happy Friday Fix Day! So, in this week’s Friday’s Fix, we look at SEO and how to achieve it, how thinking small and outside of the box is your best bet, and what you could and should be doing in 2015 to have a winning rest of the year. So, get cozy, kick back, and get ready to get Fixed, Friday style! While the title of this article immediately transported me to thoughts of my favorite Ernest Hemingway novels, what Armando Roggio actually advises is using Hemingway Editor that helps you emulate the clear prosaic style of the famous author. What the editor does is highlights areas that you could potential rewrite for simplification. As much as I hoped this was a ringing endorsement for literally working from home in various state of dishevelment as I so thoroughly enjoy doing, John Montesi’s article –like all of his articles, is smarter than that. What he’s actually saying is that bringing in outside brains (preferably with the human still attached) isn’t always the best solution to perpetuate innovation. Rather, John suggests both starting small and going big and going home. Save yourself the guesswork and check out the article; these are inspired approaches. In this article, Lauren Johnson brings “five tips for building global buzz from out-of-home ads”. Perhaps going against what many would assume “works”, Lauren advises starting and thinking small and getting outside. Take risks and be simple, she says. If you’re looking for ways to think outside of the box, this piece is for you. I’d like to offer Steve Olenski a huge word of thanks for compiling a list of what’s working in 2015. We talk about it all of the time, but he’s boiled all down into one handy-dandy list that you can use to determine if you’re doing everything in your power to be seen and heard (because nobody puts Baby in the corner). Are you going Mobile? Engaging in visual storytelling? Blogging? Social media marketing? Yes? No? Either way, check out this read to see what the other ways of being heard are and to read the details on how to make each of these approaches give you a face and a voice. Now that the year has had a chance to show us what it’s made of, we’re able to get a clearer picture of what’s essential and what’s clutter. In Jonha Revesencio’s article, he lays out the only six steps you’ll need for content marketing this year like documenting your strategy, investing in visual marketing, and curating. If you’ve ever wished you were rich and had someone planning your meals, I feel Jonha’s list kind of does that for your content marketing…just feed it these things and it will look fabulous and have the whitest teeth ever. What You Need to Know about Digital Marketing Trends! Rosalind Henshell keeps you in the know this week with her relevant piece on what you need to know about digital marketing trends. This flows nicely from Steve’s article as they both mention some of the same things (Automation! Going Mobile! ), and Rosalind makes an important point, which is that digital marketing trends change constantly, so what worked six months ago might not be so great now. Are you evolving? Okay, I’m sure Matt Janaway doesn’t mean you’re boring, but let’s be honest…some things are way less stimulating than others, right (until people need them obviously)? For example, Matt says that carpet cleaning just doesn’t jiggle his chain until his dog leaves muddy footprints all over the carpet and then suddenly, carpet cleaning just got a lot more interesting. So, if you’re one of these “boring” industries who people don’t frequently actively seek, how can you dazzle with your content marketing? Well, Matt suggests knowing your customers, tell an awesome brand story, use pictures and videos, and more (he also advises as to how, making this piece a worthy read). Are Crazy ROI Metrics Destroying Branding and Storytelling? And, did video really kill the radio star!? (Yes, yes it did. And then Jersey Shore killed video.) I digress. In this piece, John Hall poses an important question. He acquiesces that while –yes, numbers are important, telling an honest brand story and building strategy around long term metrics ranks right up there with the numbers. Additionally, John notes while his ROI wasn’t reflective of much success, their conversion rates increased by a staggering 151%, so there really is something to not putting all of your stock in numbers and focusing on the truth behind who you are. NASA: The First Content Marketers? I’m a sucker for articles like this one by Adam Hayes. I love the little dose of history tied in with the correlation to content marketing especially when it’s not obvious from the outset. Sure, we’ve all seen how vintage Disney and John Deere were inadvertent content marketing pioneers, but NASA? That’s new…go on. In this article, Adam highlights lessons and influences content marketers can take away from NASA’s lengthy timeline. Andrew Schulkind explores the world beyond your website that impacts your SEO success rates. You also have to factor in social, mobile, and security matters. Also, as Andrew points out, you can no longer deceive search engines into giving your site a higher rank. Honestly, this is for the best because now high SEO is achieved through developing a trusting rapport with your audience through authentic methods (like storytelling). So, you’ve checked one box and you’ve got a blog going (good for you! ), but right now it’s kind of lazy and just sits there; it doesn’t do anything it promised when you decided to start one –like achieving high search rankings, but how do you whip your flabby blog into shape? Easy! Just like whipping one’s own floppy bum into shape, blogs need regular updates (workouts in your bum’s case). Blog posts need to use targeted key words (just like doing targeted exercises); however, just like squats and crunches, too much of a good thing is a bad thing, so you have to strike a balance during your nice, long blog post (also, the blog looks like its on steroids if it’s over-stuffed with key words). There are a few other ways help your blog, so if you promise to check out this article, I’ll promise to stop with the gym metaphor. How Do You Measure the ROI of Content Marketing? In order to start tracking the ROI of content marketing (and guide future efforts), you need to establish some specific objectives to shoot towards. By implementing objectives or goals, you’ll be able to determine what makes great content within your industry. Your team can then make the necessary adjustments along the way to improve an effective formula. Moving forward, when you produce any single content piece, it should accomplish one or more of these goals, and your entire content portfolio should accomplish all of them. With any marketing strategy, accurately measuring and tracking efforts against targets and goals is essential in proving ROI. Content marketing is no different; when specific goals are set in place, the measurement of different metrics will be easier to track – making your content marketing strategy more effective. Though there are many different tools available to measure the value of your content; most website owners utilize Google Analytics to effectively measure their content’s success. This tool offers a huge amount of useful data, but it can be difficult to choose which metrics to track. Every company wants more traffic to their site, but traffic alone is not a great indicator of content marketing success. If it’s coupled with other metrics, however, it can be particularly insightful. In order to use traffic volume as a way to measure content marketing success, be sure to compare pages of similar content to each other, as all website pages are not created equal.For example, the home page of most websites will probably be one of the most visited pages on the site — but this isn’t always due to the content found there. If a website is correctly employing basic SEO and promotional strategies, chances are their home page will always be one of the most visited pages. Companies new to content marketing want their content (or brand) to show up in the search results. The problem is that they limit the measurable objectives for their content by focusing on traffic alone. Getting a lot of traffic doesn’t mean obtaining leads or loyal customers. Yes, you want users to visit your site, but there is much more to be measured that can improve your content marketing strategy. Another metric to consider is the Time on Page. When the average time on a particular page is much higher than your site-wide average, it suggests that this page is grabbing and keeping visitors’ attention more than other pages, indicating that the content there is worth analyzing to see what additional insights it might provide. This can tell you a lot about what type of topics your followers are interested in, or what type of content they might be searching for. That information can be extremely valuable in the future when producing new quality content for your audience. Take this knowledge and use it to create content that will establish your brand as a thought leader in the industry. Build trust and turn that into prospective leads and new customers. 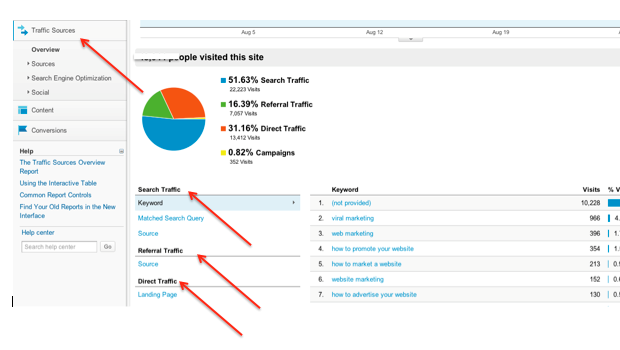 So what is referral traffic and how is it different from “regular” traffic? Referral traffic is a bit more specific; this metric shows the visits to your website or content that originally came from an outside source. In other words, if a visitor clicks on a link from Facebook or Twitter and it leads to your website, that is considered a referral traffic or a referred visit. With any content marketing strategy, you should have some content promotion and/or distribution in place to get that awe-inspiring content in front of your targeted audience. If the content is valuable,people will share, like, or tweet your content on their own. As you create better content, it gets shared more often and will likely result in more referral traffic. Referral traffic can be sign of promotional and distributional effectiveness because it provides insight on which sites are referring the most traffic and the timing of the traffic being referred. Use this information to drill down on which distribution or social network channels you use to promote the content. A frequent exercise in content marketing is to create downloadable content, such as free guides, whitepapers, mobile apps, or PDF’s. A great idea is to keep these downloadable content pieces behind a gated link — meaning visitors must fill out a contact form in order to gain access to the desired content. Other times, visitors may not provide any additional information but still be required to download the content; such as large PDF documents, extensive resource pages, or even longer videos. In those cases, it is necessary to set up Event Tracking in Google Analytics to capture the incidence of your content being downloaded. Once event tracking is set up, establish an event goal to track specific downloaded content pieces. When setting up your event goal in Google Analytics, you must set conditions for the goal and then specify a category, action, label, and value. In the case of measuring downloads, the event will be the act of downloading the piece of content. After the event goal is set up, you will be able to find the number of people who are actually downloading your content, without requiring any additional contact information from your visitors. This data can be used in conjunction with other metrics (like page views and time on page) to measure the success of your content. At the beginning steps of any content marketing strategy, it’s absolutely vital to have a defined stance on what success looks like for you and your business. Success in content marketing will always be goal-oriented; as stated earlier, you need to establish clear, measurable objectives and then use various analytics to compare production vs. objective. Define what success means for your content and how you will measure it. Establish a timetable for measuring and using web analytics to gather data on the activity on your site. Use analytic data to adapt future content for optimal performance. Every goal should include measurable milestones so that you can clearly see whether or not you’ve been successful in your content marketing efforts. This allows you to further articulate your goals so that they are clearly established; make them as specific as possible. If your goal is to increase traffic to the site, you could specifically set the benchmark “Show a 20% increase in traffic to our ‘Contact Us’ page in 12 months.” This precise goal identifies what area of your site you’ll focus on, provides a firm definition of the traffic increase you’re looking to achieve, and it establishes a deadline at which you will measure to determine the content’s success. Whatever your goals may be – from measuring overall traffic and time-on-page to conversions, referral traffic and more – Google Analytics provides a robust amount of information that can be used to measure content marketing success. And obviously, tracking your Conversion goals will be the most important metric as that shows how much of that traffic or downloads lead to a sale. Through this measurement, you can focus on the kinds of content that have generally worked for you and your competitors. With these analytics, you have the ability to adapt your content marketing strategy toward success and not waste time producing content that doesn’t have a chance. What does successful Content Marketing look like to you?